This home is situated in popular Madela Sands, Summerstrand and positioned in walking distance from the Spar as well as minutes away from Nelson Mandela Metropolitan University and the Port Elizabeth beachfront. This home consists of a small entrance hall that leads through to the large open plan lounge and kitchen. The lounge is large enough to accommodate a dining area and sliding doors leading to the gorgeous garden with it's built in sprinkler system. The kitchen provides ample built in cupboards as well as a gas hob, ELO , extractor fan and the convenience of a separate scullery. The separate sun room is a great addition to this home with access to the garden and a built in wall unit this space can be easily transformed into whatever you need, be it a dining area, tv lounge, entertainment or a study. 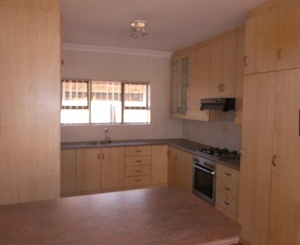 All three bedrooms are carpeted and provide ample built in cupboards. Two of the bedrooms provide access to the garden and the main bedroom has the extra convenience of walk in closet as well as a large en suite with toilet, basin, built in dresser with draws and a bath with hand shower. The main bathroom consists of a toilet, shower, basin and bath. This home also provides a double inter leading garage on remote. Position perfect and price right this is definitely a home that you will be able to settle in comfortably.